A fun, easy, and multi-sensory way to master abstract words! Find out why these words so difficult for dyslexics! Davis Symbol Mastery® provides clients with the ability to understand abstract words and gives them a picture with which they can think! After mastering the basic literacy symbols (letters and punctuation), clients are introduced to a fun, creative, and highly effective method for mastering words. Homophones like “there” and “their” are a common source of confusion for many. The pictures below demonstrate how the Davis Symbol Mastery® techniques are used to eliminate confusion with these abstract and frequently misused words. Using the creative process to master words is the best way to promote permanent learning! 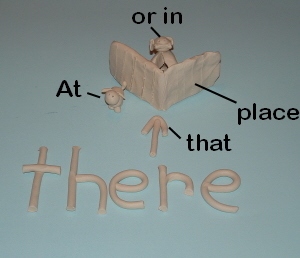 there - at or in that place. The dogs are there. their - belonging to them. Their dog is cute!